At the 1956 Motor Show, BMC announced the A95 and A105 which were not new models but a facelifted A90 and A105. The A95 had a slightly more powerful high compression engine which was uprated by 7bhp and Borg-Warner automatic transmission was available. With both the A95 and A105 the chassis engineering was not changed but the wheelbase was increased by 2 inches with a larger rear window and a longer boot with reduced sill height. The rear lights were now placed at the top of the rear wings. At the front it had a new radiator grille. The A95 now came with a Countryman version. A small number of Countryman models were made from CKD Kits in Australia and some were re-badged as the Morris Marshal. There were ten A105 Countryman built with one having an automatic transmission. In 1957 Sir Leonard Lord the Chairman of BMC had an A105 specially trimmed by Vanden Plas at Kingsbury for his own personal use. He was so pleased with the results that in 1958 he placed an order for 500 cars to be given the same treatment. 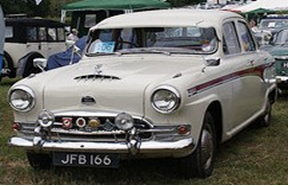 Cars were built at Longbridge without trim or upholstery and shipped to Kingsbury. To date, we believe there are only seven survivors. 28,065 built which include Countryman models. 92bhp at 4,500rpm; top speed 91mph 4-speed manual (overdrive or automatic optional) fuel consumption 20mpg. Engine and transmission: 102bhp at 4,600rpm; maximum speed 96mph; 4-speed manual with overdrive.